Planning a Cruise Ship Wedding? Setting Sail for the Cayman Islands! Are you getting married soon? Booked a cruise for your holidays? Why not make this a very special cruise and get married? Just the 2 of you, or have your family and friends joining you, and make this a fun and special cruise for everyone! Cruise ship weddings are becoming a popular alternative to the average wedding and provide a welcome change for you as well as your guests. Why not plan a romantic setting on a Caribbean beach amidst serene azure blue waters and get married to your beau under a clear tropical sky! If you want to choose a Caribbean location, then you can pick out the Cayman Islands as a perfect and idyllic location for you cruise ship wedding. Only a few years ago, cruise ship weddings were meant for only those who could really afford the costs and were a fantasy for others. However, the situation has changed in recent years. Today, the Cayman Islands are on almost every cruise ship company’s itinerary and couples can choose from a variety of cruise ship wedding packages suiting their budget. The Cayman Islands offers many wonderful beaches, and many other exotic venues. Stand barefoot in the white sandy beach, or choose one of the many alternatives. With the wonderful blue ocean in the background you cant go wrong! Seen your ship is only in Cayman for limited time, it is highly recommended that you work with a wedding planner specialized in cruise ship weddings, to help you sort out all details and making all required arrangements for your big day. In Cayman, visitors by cruise ship get married by special marriage license, which will be arranged by your wedding planner. Your planner will arrange for the minister and coordinate the specifics for your destination wedding. Once your cruise ship has docked in Cayman, you will be tendered to shore, from where transportation will pick you up and drive you to your selected location. All services you requested as transport, photographer, videographer, chairs, decorations, flowers, and champagne will be ready and waiting for you, you just have to show up! As each couple is different, each wedding is different and varies in colours and themes. 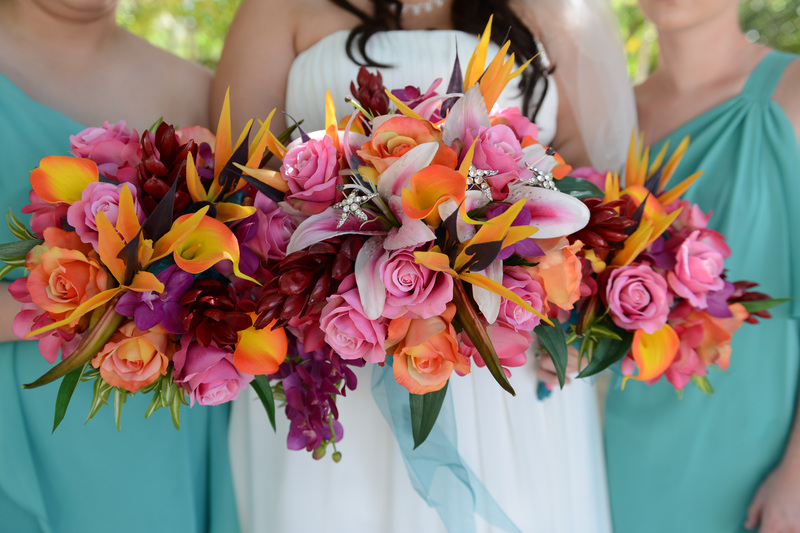 You can discuss with your wedding planner the colour theme for your destination wedding in Cayman. A beautiful colour scheme that blends with the general ambience of the wedding helps set the tone for the entire wedding day. Colours can be reflected in simple things as your flowers, invitations, programs, bridesmaid dresses….. Many gorgeous colour themes and colour combinations will help you personalize your wedding. Popular colour wedding colours are turquoise, aqua, purple or ivory. Tropical colours as orange, pink, yellow. Very “in” colours are ivory, white and blush or soft pink. Alternatively, many gorgeous colour combinations can be used to fit virtually in any wedding style and personality. Combinations consisting of colours such as mint, gold, peach, yellow, navy, white, orange, purple, emerald, jade, and ivory can do wonders on your wedding day. Simple or Grand - It’s Your Choice! Your wedding can be as simple as you want or as grand as you like. In fact, Cayman is home to many skilled wedding professionals like wedding planners, photographers, videographers, florists, cake designers, hair and beauty stylists, gift consultants, jewellers, musicians, and transport specialists. You can either chose a basic wedding package that includes the basic features such as a the minister, license and legal fees or choose a more elaborate cruise ship wedding package which includes most also photography, bouquet and boutonniere, decorations, a wedding cake and the services of a professional wedding planner. And why not stay for reception after the ceremony and enjoy some great food and have a DJ setting the tune and introduce you for your first dance? Most packages can be customized fitting your needs and make your wedding day exactly how you want it to be; the wedding you dreamed off! 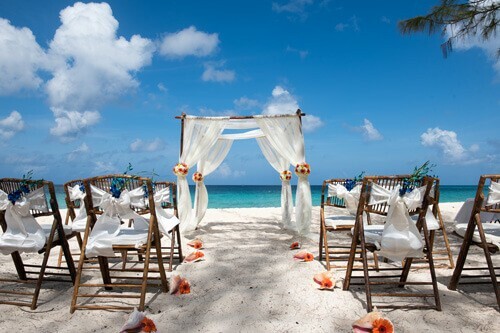 To conclude, the Cayman Islands are indeed a perfect choice for a your cruise ship wedding. Let us coordinate for your perfect organized wedding day, so you and your guests just have to show up and enjoy this very special occasion. Once back on board you’re setting sail as a newly wed couple, now on your honeymoon!